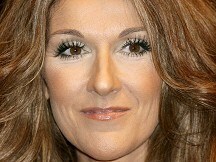 A 36-year-old man has been charged after he allegedly broke into singer Celine Dion's home near Montreal, raided the fridge and even took the time to pour himself a bath, police said. He was nabbed by police in the Montreal suburb of Laval after the alarm system went off. The international pop superstar and her husband, Rene Angelil, were not at home at the time. Dion and Mr Angelil usually live in Florida but use the Laval residence when they come home to Quebec. Laval police spokesman Franco Di Genova said the suspect was getting ready to take a nice hot bath when police arrived with a canine unit. "He opened the water taps, was pouring a nice warmish bath (and) he even managed to eat some pastry that was in the fridge," Mr Di Genova said. Mr Di Genova said police worked their way through the house, starting with the basement and finally confronted the man on the main floor. "The suspect was coming down the big staircase and was asking: 'Hey, guys what are you doing here? '," Mr Di Genova said. "So the officers replied: 'What are you doing here?' and they proceeded to put him under arrest." Mr Di Genova said the man had jumped over a fence to get on the property and used a garage door opener that he found in an unlocked vehicle to gain access to the luxury residence.